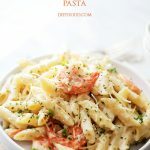 Creamy Lemon Shrimp Pasta – Lemony, creamy, cheesy Shrimp and Pasta dinner that’s ready in 30 minutes, from start to finish! Greetings, friends!! How’s it goin’? Happy Sunday! Fingers crossed, you are sitting down with your feet plopped up on the couch, remote control in one hand and a bag of chips in the other. Remember, calories don’t exist on Sundays… ahem. For that reason, I just stress-ate an entire bag of pretzel rods. And now, I will present to you THIS. THIS lemon shrimp pasta deal being ONE of my most requested/loved/favorite dinners. Last week I bought shrimp. The cooked, frozen, ready to eat kind. They were so pink and pretty. This week I found them all wrinkled up and practically dying in the fridge. Nothing new there and no harm done. I ate ’em and am still breathing. Obvi, they weren’t dying, per say. I wanted to make some sort of battered shrimp again, but I had a taste for something creamy, something where the flavor would POP, something lemony! … you know?? Sidenote: When my Mom saw this picture, she said, “And THIS is how you lure people in?!? EWWW!”. Clearly, I am my father’s daughter. THIS lady, a.k.a. my Mommy, dislikes seafood. Mucho. Back to my story about my lemon shrimp pasta… As I was sippin’ on my glass of Chardonnay while cookin’ the penne, (don’t judge. AND… you don’t drink when you cook?! ), I started dreaming about March and Spring… and yellow colors and lemons… and at that moment I just threw the shrimp in with the pasta, zested my lemon all over the sauce, lemon juice all over the counter… buuuuut, bada bing bada boom, we were done. Dinner was ready! Well, almost. I had to make the creamy cream sauce, first. 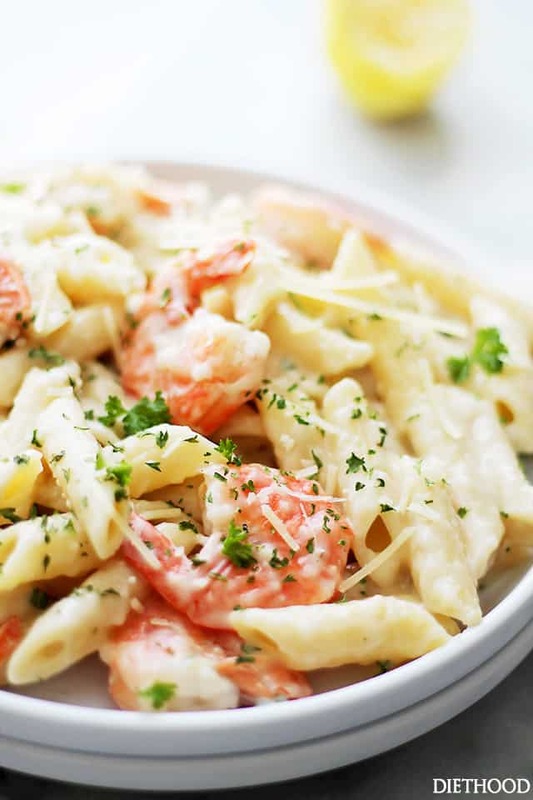 Lemony, creamy, cheesy Shrimp and Pasta dinner that's ready in 30 minutes, from start to finish! Cook pasta according to the directions on the box, adding the shrimp to the boiling water for the last 3 minutes. Add garlic and cook for 1 minute, or until fragrant, stirring frequently. Whisk in flour; whisk until flour isn't dry. Slowly whisk in the broth. Cook and whisk until mixture is smooth; continue to cook until mixture boils and thickens. Remove from heat. 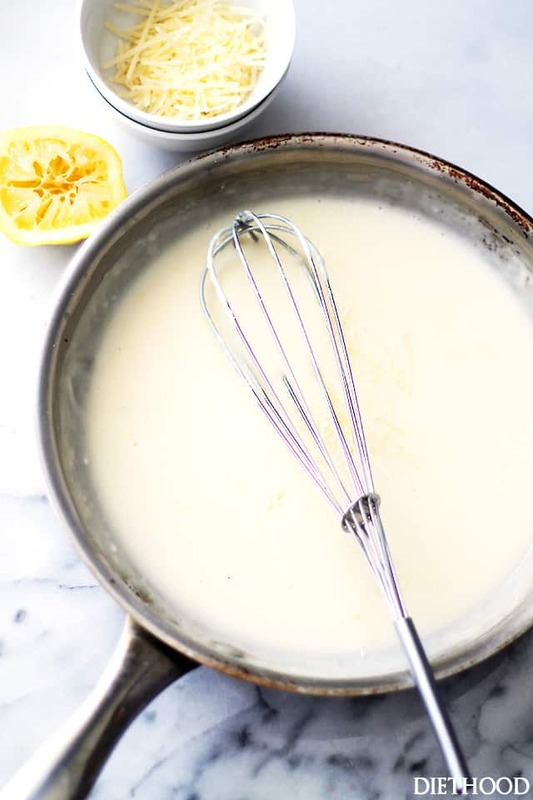 Whisk in parmesan cheese; whisk until melted. Whisk in the milk; whisk until combined. Stir in lemon zest and lemon juice. Sauce will continue to thicken as it stands. If sauce is too thick, add a little more milk. Pour sauce over the cooked pasta and shrimp; mix until combined. Stir in 1 tablespoon parsley. Transfer to plates; garnish with remaining parsley and a sprinkle of shredded parmesan cheese. Love this recipe! 5 stars…I now get regular requests that I make this. Sometimes a little tricky ensuring the consistency of your sauce is just right, but no matter what, the flavor is always on point. Great recipe, thanks!! Just made and had for dinner…it was a hit! Instead of boiling the shrimp I placed them in a baking pan, poured over with olive oil and melted butter, sprinkled with Blackened Seasoning. Placed under broiler until shrimp were cooked. Also added broccoli florets! I subbed in a half cup of Marcella for half of the broth. Came out very good, and we will be eating this again. You might have tried this with your Chardonnay. can we send you pictures of our creations. You would be so proud..
Oh my gosh! YES!!! Please do! I’d love to see! Which do you prefer: chicken or veggie broth? At first I thought, “chicken and shrimp flavors mixed together? ?” but I’ve never cooked with vegetable broth before. Help? This is so yummy! I have made it once before and am making it again for supper tonight! I add a splash of Chardonnay to mine and I also use uncooked shrimp (the bags of them they sell at Sam’s club are giant and succulent and delicious!) I’ll add my go-to shrimp cooking method in case anyone is interested.. It’s simple but it adds awesome flavor to my pasta dishes and it worked along with this one too! I grate a clove of garlic or 2, add it to a large bowl and throw in some red pepper flakes, and 2-3 tbs olive oil. Then I used the leftover lemon juice and zest that I got off my lemon I used for this recipe. (It was a large lemon) and throw the shrimp in (thawed) and mix them around to coat in the mixture. A quick marinade of sorts. while my pasta is boiling, I cook those up- straight into a pan on med-high heat- about 2-3 mins per side.. Then I plate them and set aside while making sauce. I added them into the pasta at the end as per usual. Might want to increase liquids but mind still turned out great! Anyway, this Is my go to method for cooking my shrimp for a lot of pasta recipes that I love… This recipe included!! Sooo good. Oh my gosh… you made me drool!! Can’t wait to make this meal again, using your method! Thank YOU!! sounds wonderful – just got abag of fresh large shrimp from Mexico. will wait for Saturdat nite and make it special.. I totally agree, this sounds awesome. I always put the shrimp in last!! Sounds delicious ! 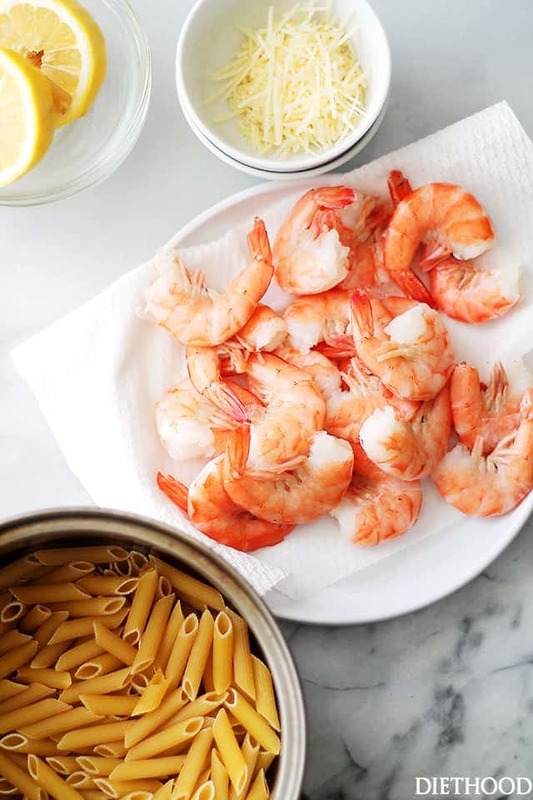 Is the shrimp already cooked for this recipe ? Thanks for your answer. Hi Anne! The shrimp I used here is sold in a plastic bag, and they’re already cleaned and deveined. I cook the shrimp together with the pasta, the last 3 to 4 minutes. I have stated that in the recipe directions – please let me know if there’s something that’s not clear. Thank YOU! This was really good. I doubled the sauce. Very special dinner for the week. I as wondering if you could substitute cream for the skim milk. Would that make it even smoother? Also, someone asked about adding Chardonay. Would that work and would you reduce some of the liquid? Chardonay gives such a nice flavor. Hi Mary!! Your substitutions sound A.MAY.ZING! 😀 Definitely go with the heavy cream and if you’re going to use chardonnay (YUM! ), reduce the liquid. Now I need to make it your way! Have a wonderful Sunday! I just made this tonight – SO good! I needed this bright, lemon flavor on this cold and wintry night! Thank you! 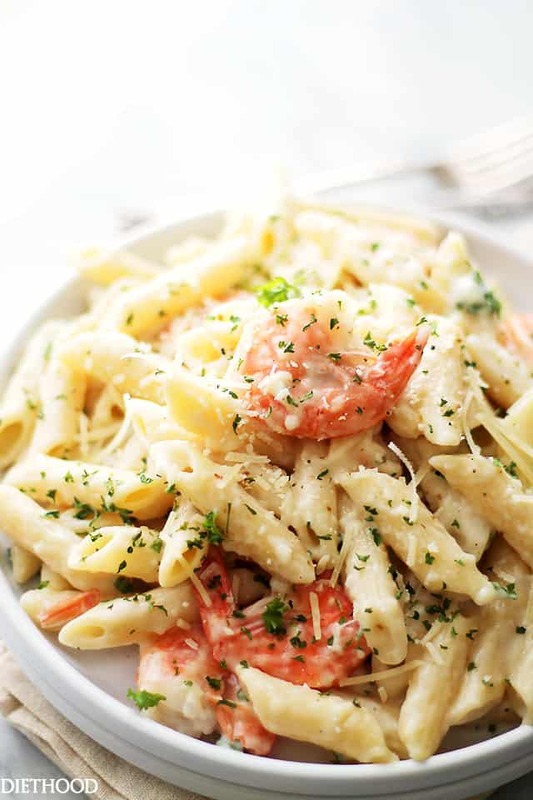 All that cream and chees-y pasta is making me drool. This looks TOO good! My only question is, can I add chardonnay to the sauce?! 😉 This pasta is creamy perfection! Love it! I have more One Direction songs on my phone than I care to admit. This looks delicious! 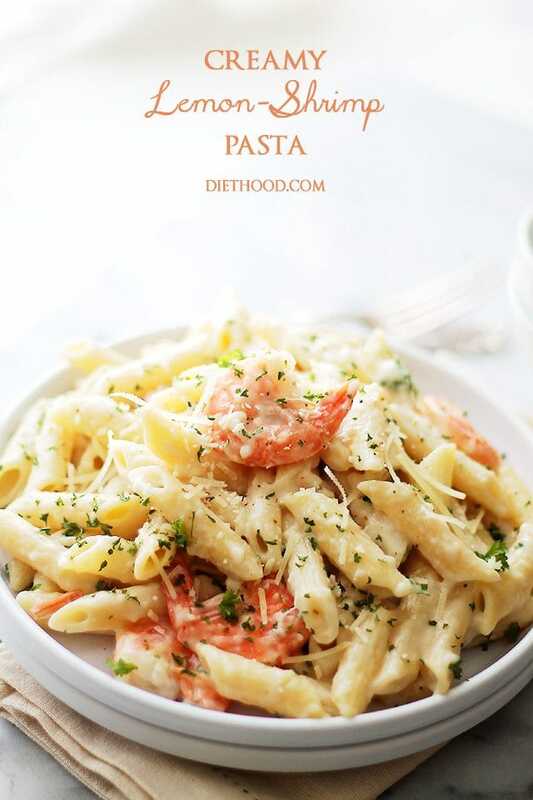 I love how fresh all your pasta dishes look. I am tempted by all of your photos! Love!